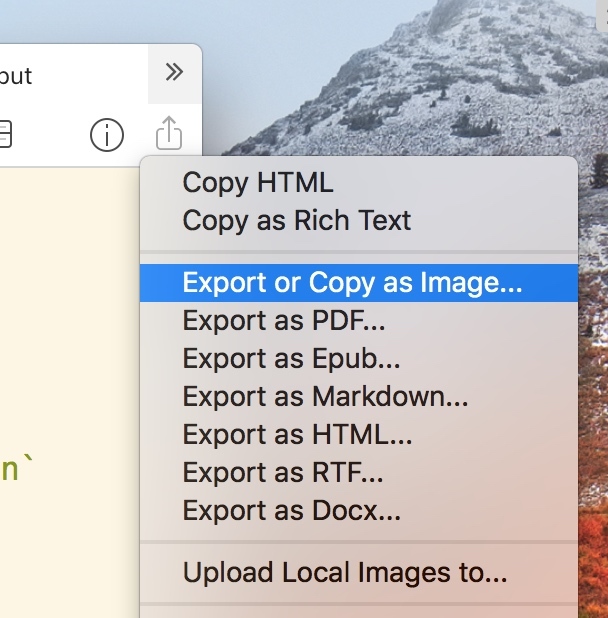 Use MWeb to export Markdown documents as images, HTML, Epub, PDF, RTF, and Docx. This function is mainly used to paste the current Markdown document into the mail (mail.app), Pages.app, Word.app. In the case where the Markdown document has a local image, exporting to the docx function does not currently support the image very well. At this time, you can use the Copy as Rich Text, and then press CMD + V in the above mentioned three software, so that the picture can be successfully pasted. You can set the width of the exported image and press Copy as picture or Save as picture button, or use the Share button to share the image. You can check the Create a Table of Content for PDF (TOC) checkbox to generate a PDF document with TOC. The shortcut for this function is CMD + P.
As shown in the image above, you can modify the cover of Epub. Export to HTML, RTF, Docx, etc. Exporting to HTML using MWeb will export a single HTML, and if there is a local image, the local image will be Base64 encoded into the HTML. Also, exporting to Docx does not currently support local images.